For the fifth time since mid-2017, the Bank of Canada raised interest rates, hiking the overnight rate by a quarter of a percentage point to 1.75 per cent on October 24th. Higher borrowing costs will continue to weigh on prospective first-time homebuyers, resulting in delayed buying, and increased rental demand. In October, the average rental property on Rentals.ca was listed for rent at $1,836 per month, with the median property listed for $1,700 per month. It should be noted for this report that properties listed for above $5,000 a month, and single-room rentals below $500 a month were eliminated from the sample of units analyzed. Approximately 56% of the listings on Rentals.ca in October were rental apartments, 20% were condominium apartments, and 19% were single-detached or semi-detached houses. 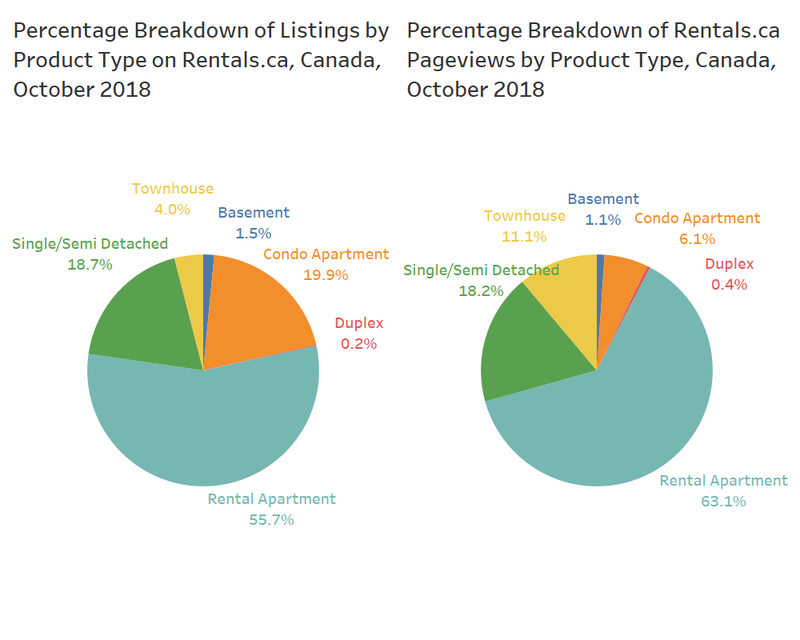 However, rental apartments captured 63% of the pageviews on Rentals.ca in October, while condominium apartments captured just 6% of the pageviews. There is clearly a preference among tenants for the security of tenure that a typical purpose-built rental apartment provides, in comparison to a condominium apartment that can be sold by the owner at any time. A second theory, which applies to the Toronto market, is the fact that condo apartments have leased so quickly (and often with bidding wars), that some prospective tenants will not bother to call or email the listing for a showing, fearing they have already been leased. A third factor reducing the number of pageviews for condominium apartments is the rental rate. In Canada, the private landlords are asking $2,481 a month on average for their condominium apartments for lease. By comparison, the average rental apartment is being offered at $1,469 per month. It should be noted that the share of condominium apartments for lease skews heavily to the higher-rent GTA marketplace. The average townhouse for lease in Canada was listed for $1,529 per month on average. Townhouses have also garnered more pageviews than their market share of listings, suggesting many potential first-time buyers and trade-up renters are looking at leasing a townhouse as opposed to buying a single-family home or staying in a leased apartment. On a provincial level, Ontario had the highest rental rates in October, with landlords seeking $2,138 per month on average. 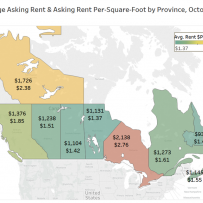 For units where sizes were available, the average rent was $2.67 per-square-foot (psf) in Ontario. The Northwest Territories was second with an average rental rate of $1,726 per month, but the sample size of properties was very small. British Columbia was third in the provincial rankings with units listed for $1,376 per month, but the sample of properties is short on listings in the high-rent Vancouver area. The average rental rate in Newfoundland and Labrador was just $930 per month, the lowest among the provinces in Canada. On a municipal basis, Toronto remains the most expensive Canadian city to rent in, with asking rents for one bedroom units averaging $2,166 per month in October. The average asking rent for a two bedroom unit in Toronto was $2,589 in October. Municipalities in the Greater Toronto Area (GTA) dominated the list of the most expensive rental markets in Canada (please note: Rentals.ca is actively working to increase listings in Vancouver, but due to a small sample size, the average rental rate was not included in this report). Etobicoke, Richmond Hill, Mississauga, North York, East York, York, Brampton and Oshawa were all in the top 10 municipalities for average rental rates. Montreal was the first non-Ontario market on the list, with the average one bedroom rental unit listed for $1,360 per month, and the average two bedroom listed for $1,859 per month. How do the rental rates in Montreal compare to other Canadian cities? The average three bedroom unit for lease in Montreal is being offered at $2,305 per month, more than $1,000 higher than the average three bedroom for lease in London. In London and Saskatoon, the average studio units are available for under $900 a month on average, while studios in Ottawa are relatively expensive at over $1,200 per month. Two of the most popular markets for listings on Rentals.ca are Toronto and Ottawa. The chart below shows that lease rates in Toronto are about 30% greater in Toronto than Ottawa when controlling for the built form and number of bedrooms. When looking at just rental apartments, that premium is lower at 20%. The composition of units listed, and tenant preferences in the Ottawa and Toronto rental markets are very different. The chart below shows the market share of pageviews by built form, with rental apartments accounting for 41% of the pageviews by prospective tenants in Ottawa, with single-detached and semi-detached listings accounting for 37% of the Ottawa pageviews. In Toronto, rental apartments captured 68% of the pageviews by prospective tenants, with condominium apartments accounting for 19% of the listings in October. Pageviews on Rentals.ca and housing demand are not interchangeable, the content of the listings can heavily influence online activity. The chart below shows the number of pageviews by the location of the rental listings in Ottawa, with three locations sticking out as the most viewed (see large red markets). The three locations 170 Lees Avenue, 111 Cooper Street, and 1658 Baseline Road, as marked with large red dots indicate that these spots received the largest amounts of page views, the one major thing in common, their listings feature 3D Virtual Reality unit walkthroughs. Toronto remains the most expensive city for tenants in Canada, but the rental rates can vary dramatically by neighbourhood. The chart below shows that Yorkville had the highest average rental rate on Rentals.ca in October at $3,468 a month, followed by the Entertainment District at $2,889 per month, and the Toronto Waterfront at $2,879 per month. Rounding out the top ten was Parkdale at $2,207 per month on average. The maps below show the rental rates and locations of the October listings on Rentals.ca for the most expensive Toronto neighbourhoods. Several markets in Canada continue to experience sharp increases in rental rates. Rentals.ca together with Bullpen Consulting will continue to monitor pricing trends across the country.